Garbage incinerators can stop bear problems. Burning in pits or the common "burn barrel" attracts bears. The fuel drains into the dirt or into cans beneath your garbage so that garbage is only scorched. The fire smolders for hours. Bears will dig up half-burned garbage. Fast burning fuels and inadequate air, such as in a pit or a drum result in scorched and smoldering garbage that attracts bears. Garbage incinerators can save time and money. They can be located close to camp and the limited ash does not require heavy hauling. Bear damage to your camp, cabin, or lodge can cost thousands of dollars to repair. Open pit fires can cause costly tent and forest fires. Garbage hauls to town dumps can be costly in the long run. If you allow bears to get into your garbage you risk prosecution under Alaska Department of Fish and Game regulation 5AAC 92.230. This regulation makes it illegal to negligently leave out food and garbage in a manner that attracts bears. The penalty is $100 per incident. Incineration is a great idea for recreational cabin owners, small camp operators, fish camps, or larger work camps. Slow burning fuel and good air flow in a contained fire generate enormous amounts of heat. With proper incineration even wet garbage will burn completely, leaving no food odors. The common 55-gallon drum burn barrels with a few holes are inadequate for incineration. Unless modified substantially, burn barrels do not have adequate air and slow burning fuels and result in scorched and smoldering garbage that attracts bears. Incinerators are generally two types: small, passive air flow incinerators that do not need electricity for fans or fuel pumps, and active flow incinerators that do require power. 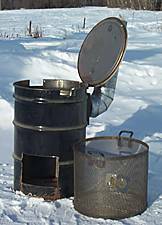 Passive flow incinerators, such as modified burn barrels (see example below), are more appropriate for recreational cabins or small camps where only one or two bags of garbage are produced a day. For camps producing larger amounts of garbage, active flow incinerators are more appropriate. Some models can be broken down to fit in small aircraft. You can incinerate anything with a food odor--food waste, cooking grease, cans, bottles, gray water residues, and most kitchen garbage. You should not incinerate anything that might explode or cause toxic fumes such s kitchen cleaning powders and sprays, treated lumber, batteries, or aerosol cans. "The preferred alternative for disposal of garbage that may attract bears is incineration at a facility that meets ADEC standards for combustible residue…Large field camps (more than 15 people) should dispose of garbage by daily incineration in a fuel-fired incinerator that meets ADEC standards…Small permanent facilities (e.g., lodges, weather stations) or large nonpermanent camps (e.g., project fires) should daily segregate and store garbage in a bear-proof container for backhaul to an approved disposal site. Alternatively, (a) putrescible waste and other combustibles could be incinerated in a locally fabricated incinerator meeting ADEC standards for residue." Used improperly or in extreme conditions burn barrels and incinerators can cause wildfires! Complete incineration of wet garbage items requires a slow burning fuel, such as diesel or kerosene, or the aid of propane or electricity. Regardless of what you use all incinerators require plenty of air to work properly. Only non-toxic materials should be burned in incinerators. Incinerators in areas accessible to bears should be cleaned at regular intervals, as residues can an attractant. Accumulation of ash can also blocking air flow. Incineration of garbage can leave a temporary odor trail that a bear could follow. Where feasible, the incinerator should be located downwind from the camp or tent area (and inside the electric fence if there is one). Burning should be scheduled during the day or immediately after dinner when people are still awake and active. A camp producing one full garbage bag a day can use a homebuilt incinerator made from fuel drums. Larger camps can get by with similar homebuilt models, made from culverts, but should look to efficient forced-air, fuel-fired, or electric commercial incinerators. See below for vendors. Garbage must get really hot before it will incinerate. The sizes of the vent and chimney are critical to get the airflow required to support a hot fire. If it doesn't burn well, raise the chimney. "Empty" fuel drums need to be steamed or washed out, or filled with water or exhaust before they are cut or welded. If not, residual fuel fumes can cause serious explosions Avoid using gas drums. Most garbage is too wet to burn on its own. To prevent explosions, slow burning fuels like diesel or stove oil, wood or cardboard should be used rather than highly flammable fuels. A lighter torch may be used in the vent to start the fire. Suspending the garbage in a steel mesh basket or by a grill helps dry it out and ensure that the airflow is maintained. A removable basket greatly simplifies ash removal. Size the burn chamber for one bag of garbage. Don't store garbage in your incinerator "until there is enough for a good burn." If you leave wet garbage in the incinerator it will attract bears. IMPORTANT: The Alaska Department of Fish and Game does not guarantee nor warrant the design, effectiveness and/or safety of these devices under any circumstances. Train every incinerator operator in the safe use of the incinerators. Suggestions for building your own incinerator are contained in the attached files. This incinerator weighs approximately 150 pounds and comes apart into two sections for easy transportation by 4 wheeler, snowmachine, boat, or appropriate aircraft. A demonstration model of this incinerator can be seen at the ADF&G office in Soldotna or in Spring 2004 in the Caribou Hills on the Kenai Peninsula. Aleckson Fabricators also makes bear-resistant containers from aluminum and steel. Compact, high efficiency, forced air, diesel fueled incinerators manufactured and sized for customer needs.